It’s Spring time and the weather is more like Summer here. The kind of weather where I’m looking for easy and light snacks for myself and my family. I don’t want to spend a lot of time preparing food, heating up my kitchen, or eating heavy food. We like to spend as much time as we can outdoors – hiking, going on picnics or just playing in our backyard. So I like snacks easy to pack or grab on the go. One healthy snack I’m quite fond of is Old London’s Melba Toast. The Melba Snacks Sea Salt Whole Grain is my favorite, and my husband and son really like the Bagel Chips Spicy Cheddar. I like to eat the Sea Salt plain or topped with a slice of tomato brushed with olive oil, oregano, salt and pepper, and a little Parmigiano Reggiano or provolone cheese; then broil them for a minute or two. Delicious! Place on baking sheet and quickly sprinkle with chopped pistachios. I’m trying hard to adopt a healthy lifestyle by eating a well-balanced diet with healthy snacks, while incorporating more exercise into my day. Old London is making that easier. Check out more about their products at www.oldlondonfoods.com. Now what could be better than delicious melba toast snacks? How about enjoying them while vacationing in Hawaii? 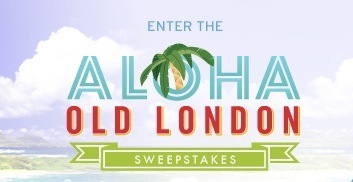 You can enter to win the “Aloha Old London” Sweepstakes. Old London will send one lucky winner and a guest on a once-in-a-lifetime vacation to the energizing island of Oahu in the Hawaiian islands. While soaking up the beautiful Hawaiian sunshine, experience everything this tropical paradise has to offer with dinner for two at Tropics Bar & Grill at the Hilton Hawaiian Village Beach Resort & Spa, one Hawaiian Lomilomi Massage at Mandara Spa at the Hilton Hawaiian Village Beach Resort & Spa, a private cooking lesson at the award-winning Chef Mavro restaurant, two Alii Luau packages at the Polynesian Cultural Center, and surfing lessons at world famous Waikiki Beach. The four-day, three-night, all-expenses paid experience also includes air travel and accommodations at the Hilton Hawaiian Village Beach Resort & Spa in Waikiki. I would so love a trip to Hawaii, so I’ve already entered. What are you waiting for – hula on over to www.Facebook.com/OldLondonFoods for more information and to enter the sweepstakes. Entries accepted March 11 through June 30, 2011. Oh, and be sure to let us know if you enter and win, so we can envy congratulate you! Just so you know – I wrote this review while participating in a blog tour by Mom Central Consulting on behalf of Old London and received product samples and a gift certificate to thank me for taking the time to participate.